"This is my husband's favorite recipe for cheesecake. The flour adds a texture that makes it unique. You can use a pastry crust instead of graham, if you prefer." Mix together cream cheese, sugar, and egg by hand. Gradually mix in flour. Stir in vanilla. Blend in milk until smooth; add more liquid if batter is too thick to pour. Pour into graham or pastry shell. Bake for 40 minutes, or until top is golden brown. Refrigerate overnight. I've tried a couple of different cheesecake receipies and keep coming back to this one. 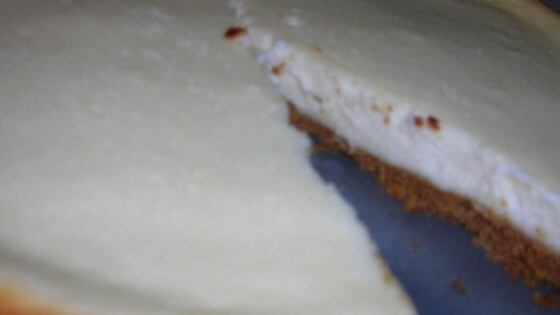 The flour gives the cheesecake a little extra creaminess. Love it! Dont like this cake like texture. It really ruins that light cheesecake flavor. It's my first time baking cheesecake, I used light cream cheese. It's so yummy! I made my own crust which added to the prep time but it was still very easy and quick to make. Also I used fat free cream cheese but the result was still very creamy and tasty. I used this recipe to cut the fat grams and fooled everyone!!! I would suggest this recipe to anyone looking for great taste and less calories. Loved it. I used the "2 extra servings" pre-made crust, and it came out just fine. Tastes great with "supreme strawberry topping". will definitely make again. Good Cheesecake! The family loved it, I will definitely make this again. Thanks for the great recipe!